Does your jaw click or do you get head aches or a sore cheek, temple or neck, particularly when you wake up in the morning? It could be that you are clenching or grinding your teeth. Clenching or grinding, clinically known as bruxism, is unfortunately very common today with our modern, fast paced lifestyles. In most cases, this can occur while you are asleep and sometimes you may not even be aware of it. You may also notice that you might be clenching your teeth during the day, perhaps whilst concentrating at work or at the computer. The most commonly found causes of grinding our teeth are linked to various stresses or due to our bite, if our bite is "out" or unsupported. The problems that bruxism may cause include excessive wear of the teeth, inflammation of the muscles that support our jaw, or even problems within our jaw joint (which sits in front of the ear). These can be mild or become quite serious and debilitating. Your dentist can take a close look at your teeth and jaw joint and assess whether you are suffering from bruxism and whether they need to do something to treat this. It may be that a night splint, known as an occlusal splint can be worn at the night to protect your teeth and your jaw joint from this potentially irreversible damage. Soreness or tiredness of the face, or tension headaches even extending down the neck. A general pain of the teeth and a general sensitivity to cold. Flattened or wearing teeth. Have a close look in the mirror. Do you see the teeth looking a little rough or thin? Do you see little crack lines in the teeth? Have you had a few teeth breaking? Has someone told you they hear you grinding your teeth? It's possible to be grinding your teeth without hearing any noise from gnashing of the teeth, but if someone can hear the grinding, it really means that there will be a lot of wear and tear being driven through the teeth. Do the teeth feel a little loose? 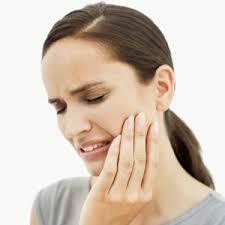 Any stiffness or pain within your jaw joint?